Muhammad Ali would have enjoyed being in attendance at the Saints game the other night. First, ‘Niner head coach Mike Singletary tried his mouth his team to victory, saying his team would “stop Drew Brees” and left “no doubt” they would move the ball against their opponent, despite them scoring a whopping 6 points against the flaky Seahawks the week before, while on the wrong end of a double digit waxing. Then, the Saints played a veritable reprise of Rope-A-Dope in Zaire, taking San Fran’s best punches before finally putting them away (it’d be callous to say out of their misery). To Singletary’s credit, albeit a desperate one, his team did want it more, having more red blood to boil, which essentially is why the Saints were in danger of losing it. QB Alex Smith had his best game as a pro, allowing for the talents of RB Frank Gore, TE Vernon Davis, and WR Michael Crabtree to be on display. On defense, Patrick Willis may be the best linebacker in the league, and the Stones Of The Saints met their match up front, ‘dis night anyway, with a certain P.T. Cruiser stuck in bumper to bumper traffic. San Francisco will rely on the quarterback position this season as much as any team to have a decent time of it, assuming whoever is taking snaps from under center has nine lives. A nice adjustment to a deep pass by Marques “Emcee” Colston set up Garret Hartley’s blocked flutterball that brought a halt to the wagon train. In a pre-season post on here, Nostradmus’ Bottom Line On The Saints, it was said to expect the Saints to play with less urgency but more confidence, all year. Monday night was a perfect example of this forecast. Despite putting themselves in position to strike gold all evening, the 49’ers were ahead on the scoreboard only once, and not for long. “Winning Ugly” has become the latest football misnomer. The NFL season is a marathon in a jungle, so each passing of a tree, no matter how and which way, is a positive check on the log. Sure there are concerns; a naysayer texted that the Saints’ demise will come from them not being able to stop the run. The Black & Gold’s apparently more physical defense being mentioned in the same post with The Steel Curtain on the last write was purely coincidental. But tip drills that result in picks are a tight positive. Regardless, the team’s record in this nascent season is simply gorgeous. More importantly, their level of play has upside. New Orleans won the game but suffered a major loss. The wince on Reggie Bush’s face and the lack of weight being put on his leg as he was helped off the field indicated trouble. Fortunately, it’s only a leg bone break (if that makes any sense), as opposed to nasty ligament damage that has been known to permanently change many a player’s wheels, for the worse. The Saints won’t miss the frequency, but will miss the impact of his playmaking. They will have to try to cook opponents with plainer ingredients. As an onlooker accurately remarked: it’s been a tough year for Reggie Bush. The price for watching a Saints game can be paid for with high anxiety. 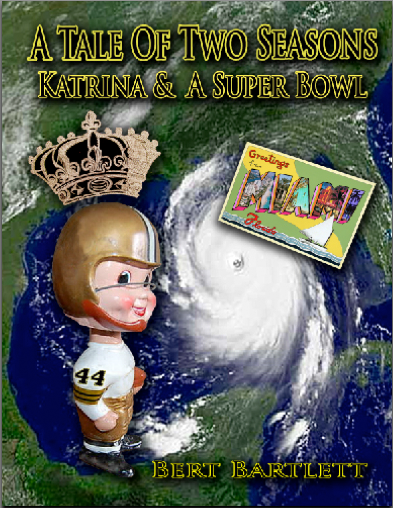 Intangibly, longtime fans of the team, pre-Katrina, and particularly since their inception, are understandably expectant of something ugly to roll out of the closet, a shoe to fall off, or for the decorative Faberge egg to bust into little pieces, all over the bathroom floor. There are some serene theories about abundance in this world that are laced with the ability to receive it. Lead us not unto temptation, but deliver us from the evil, of saddling this outfit’s karma with countless sins of the past, those committed by somebody else. Yes, to a very real extent, all naturalized citizens of The Nation need to try and get over it, as difficult as ‘dat may be. If the pre-K Saints are Generation X, as in cross out much of the past forty years, then this group is Generation Y, as in – why can’t there be another title in the making? The symbolic case for departure may be closed, in that the Saints just won a tough game, on the road, on the last play – on a blocked kick. Moving on, back to earth, wounded ducks cannot be a trump card for the Saints when they host Atlanta in the Superdome this Sunday. The Falcons, not the 2-0 Tampa Bay Bucs, are most qualified to wrest the divisional crown from New Orleans. Young quarterback Matt Ryan has the profile of becoming as productive and valuable to Hotlanta as Drew Brees is here. Fans in San Diego heavily regretted RB Michael Turner’s departure to this team. He gobbled up yards against the Saints last year. The Falcons slipped last season because both of these pieces were hurt and on the shelf for much of it. Tight end Tony Gonzales is still Chairman of the Board in the league at his position. The Falconies just thrashed the Cardinals 41-7 last week, leaving them declawed and in a pool of their own blood, as respectfully as on the street. And that other Deep South city will ship in plenty of their own Souls in support, many on Greyhounds, them somehow having winged it for tickets. Get ready Saints; these guys can play, are spicy, and are not chicken. They, and their fans, are plenty capable of pronouncing We ‘Dat. The only bad omen for the home team will be if Alfred Hitchcock is spotted sitting alone up in the Terrace, staring straight ahead, hands in his pockets, wearing a black derby with a thin red band around it. Who can forget the impossible, menacing look of The Birds?